With the patented modularity of the V Series tunnel finishers, you will never have to worry about your production need exceeding your tunnel’s output. Leonard Automatics’ Simple Addition add on module will keep your tunnels capabilities right in line with your growing business. This may be the last tunnel you ever buy. The V Series U-turn tunnel finishers are the perfect fit for high volume industrial laundry applications. The U-turn configuration allows for higher production within a relatively small footprint while containing the heat and controlling the airflow more efficiently than in standard straight through models. As the leading innovators in tunnel finisher design and construction, Leonard Automatics, Inc., works hard to continually improve our products. It is our goal to provide you with equipment made from the highest quality materials and components so you can be assured the equipment you purchase will provide years of trouble-free service. 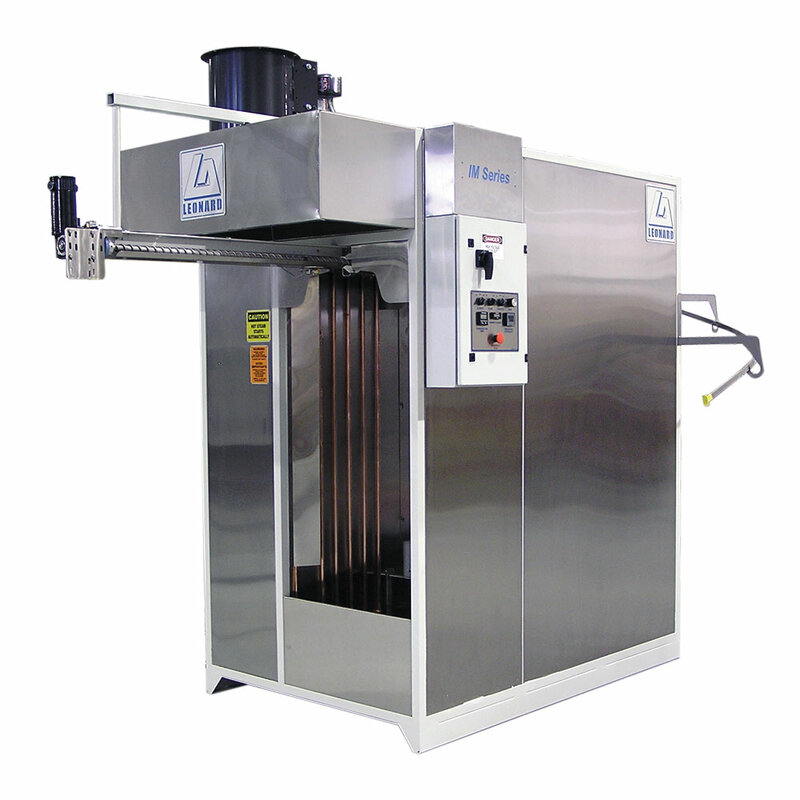 In 1999 an important feature was added to the V Series U-Turn Garment Finisher… expandability! With our patented process, your new finisher can grow as the demands of your business grow. With Leonard Automatics as your partner, you will never outgrow your investment. Your new V Series finisher could be the last tunnel you ever buy. Just like the rest of our tunnels the V Series finishers are constructed with stainless steel panels to provide the high level of corrosion resistance needed for continued operation in the extreme environment of an industrial laundry. The finishing of a garment starts in the steam chamber. The design of our steam header creates high velocity steam that carries more energy to the garment and achieves proper finishing temperature faster. More steam heat is delivered to the garment resulting in better temperature rise without increasing floor space requirements. 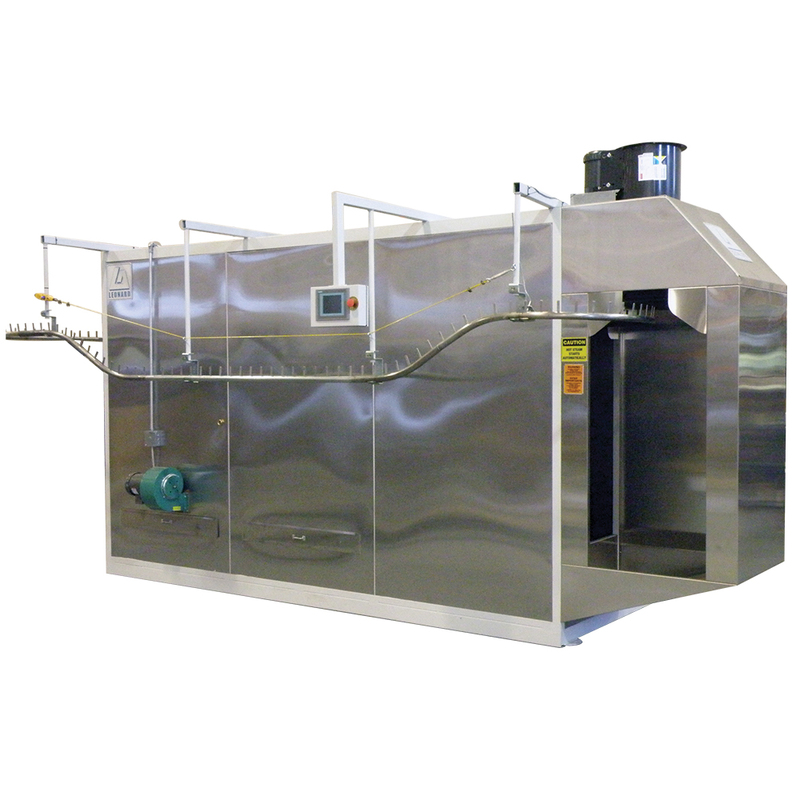 The steam tube configuration fully surrounds the garment with steam. Leonard Automatics is proud to feature the PLC Interface Control Center on the V Series of products. The touch screen allows for intuitive and straightforward access to all tunnel operational controls. Features include automated troubleshooting, maintenance schedules, alarm logs, PM schedule, runtime history and much more. Total tunnel control is now at your fingertips. Shown is actual temperature data* taken from within an actual VTP Series machine in production. Probes recorded the air temperature above the garment (RED), the garment temperature inside the shirt pocket (GREEN) and inside the tail of the shirt (BLUE), and the air temperature 6 inches below the garment (BLACK). The temperature differential between the red and black lines shows that moisture is being removed through evaporation. As the four lines converge, the garment is dry and the finishing is complete. *Data reflects extracted pants being processed.